German Shepherd enthusiast from Ontario, Canada. My name is Angel. 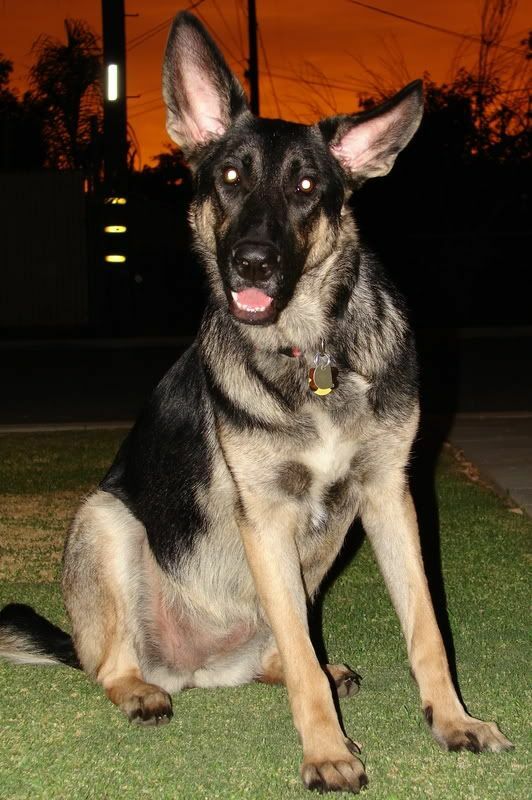 I am a German Shepherd mom from Ontario, Canada. My pride and joy is Hunter, a 19 month old male out of West German working lines. We train and compete in Schutzhund and competitive obedience, but do tons of other stuff as well. This month we are going to see if we can get him certified as a therapy dog. I am a dog nutritionist and trainer with K9 Instinct, so I will likely contribute a lot to those sorts of discussion. East German Line? Would that be Czech/DDR? Would love to see Pictures of your dog! I love the Czech/DDR German Shepherd lines, I just love working German Shepherds all together. In the future(way in the future) I'd love to get one. Hope your dog does get certified as a Therapy dog, that would be wonderful! Thank you! No, he is not DDR/Czech - West German. He's the handsome beast in my avatar, but for good measure I'll post a picture of him! Ah I'm not sure why I read that as East He is very handsome! I have a german shepherd as well, she's almost 7 now. She's a bit on the dorky side bad breeding to blame of course. But still very sweet! I've got a border collie that I'm training in agility right now, with hopes to compete someday. We are also getting into flyball! Lovely Shepherds! I am totally addicted to this breed. Here's a picture of her American bred...As far as I know there are no imports in her lineage. Amazing how quickly a line can go bad...This dog actually has ties 2 or 3 generations back to Covy-Tucker Hill's Manhattan and Atlanta's Mystique. She's just a dork that would get DQ'd for those ears lol. Just out of curiosity, what is your dog like temperament wise? I realize that GSD's are supposed to be one of the most intelligent dog breeds, but all the ones I meet tend to be a bit slow. My border collie watches everything I do, is very attentive, can learn by observation and is very drivey. I imagine that's more what a better bred GSD would be like. Hunter's temperament is to die for. He is aloof but friendly, great with non-threatening strangers and just a dream with children - very gentle and tolerant. He is high drive, high energy and has excellent drives for work. High prey drive, excellent defense drives coming out as he matures. Strong fight drive and hunt drive. Naturally protective, having protected me from a mugger once already. He is solid in terms of nerve, nothing bothers or frightens him. I can take him anywhere, do anything with him, he is bombproof. He is excellent in protection, nice full calm grips and bites hard. He loves to track, and tracks every chance he gets, and his obedience is very enthusiastic and with great focus. He has an off on switch, as well. A beast on the training field, a couch potato at home. Super cuddly, very much a velcro dog, always at my side. Very nice, social dog. Loves other dogs. Excellent off leash, very obedient and solid recall. He has a fantastic obedience foundation, acts as my demo dog for training. He is my dream dog, my heart dog - everything I have ever wanted in a German Shepherd. Last edited by K9Instinct; 01-08-2013 at 01:26 AM..
Rosie is pretty, but almost total opposite of Hunter She's dopey, clumsey, slow, has about zero prey drive...I can show you pictures of her with birds and cats crawling all over her. Oblivious to scents and most of the world actually. Recall is good...If she notices you're calling her. I can't take her out much either, she's pretty nervous. But in the house she just wants pets.